During a busy 5 days you will learn how to mark out and precisely cut a whole range of woodworking joints. Using both handtools and woodworking machinery you will join timber without the use of screws or nails. The number of joints covered on the course will depend on the speed that you are able to work. You will certainly be making hand and machined Rub Joints, Tongue & Groove Joints, Mortise & Tenon Joints and hand cut Finger Joints and Dovetail Joints. Depending on your progress, you will have the opportunity to also make Biscuit Joints, Halving Joints, Dowel Joints, Mitre Joints, Bridle Joints, Housing Joints, and KD (Knock Down) Joints. Comprehensive notes and all timber will be supplied at no extra cost. It is not necessary to have attended a course prior to attending but it is not suitable for complete beginners. For those students who have previously atttended my Tool Tuning & Sharpening Course you will have tools sufficiently sharp to achieve precisely crafted joints. For those of you without sharp tools there will be honed tools available for you to hire. These tools will be sharpened prior and during the course. The tool hire cost should be booked at the same time as booking the course. This course is suitable for people who have done some woodwork but would like to improve their skills. This course would improve your understanding of furniture construction and skill level. The following is a list of the possible joints available to learn on the course. Details of all these joints will be included in the course notes given to every student on the course. 3c. Through Wedged Mortise & Tenon - using a mortiser and a bandsaw. 6. 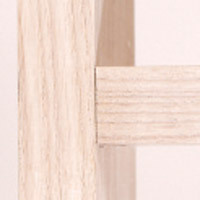 Dowel Joints - including how to make your own hardwood dowels. 7a. Halving joint in the middle of timber - hand cut 7b. 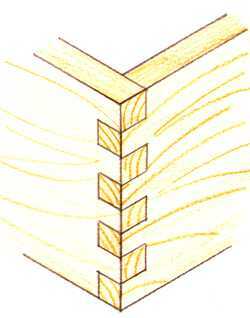 Pegged Halving Joint at the ends of timber.